The global industry could be worth $200 billion someday, and Canadian firms are ahead of the game. 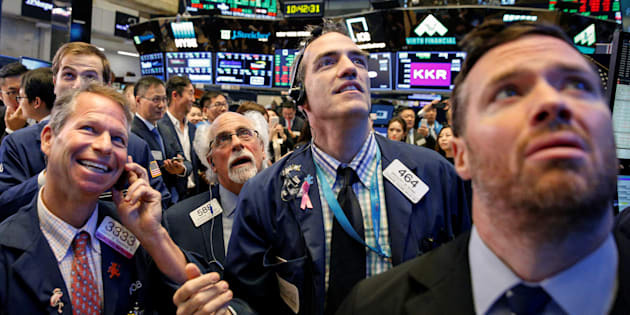 Traders watch stock prices on the floor of the New York Stock Exchange in New York, Sept. 19. Canadian cannabis companies are making giant gains in the U.S. stock market ahead of legalization in Canada next month. NEW YORK — Reefer Madness has gripped Wall Street. Investors are craving marijuana stocks as Canada prepares to legalize pot next month, leading to giant gains for Canada-based companies listed on U.S. exchanges. Billions of dollars have poured into the stocks in the last few months, and there's a lot of excitement and a ton of green (money, not leaves) flying around as investors consider the kinds of opportunities these companies might have as the marijuana market in Canada grows, along with the possibility that the U.S. and other countries could one day follow suit. The value of one company, British Columbia-based Tilray, has jumped tenfold since its initial public offering just two months ago, and is now worth considerably more than Macy's or Hasbro. This week, Coca-Cola acknowledged it could one day offer cannabis-infused drinks, although it doesn't have immediate plans to sell them. That came after reports Coca-Cola was in talks with Aurora Cannabis about drinks containing cannabidiol, or CBD, a marijuana component that isn't psychoactive. Aurora stock, which is listed in Canada, surged. In August, Molson Coors said it will team up with Hydropothecary Corp. to sell marijuana-infused drinks, and Canopy Growth announced a $4 billion investment from Constellation Brands, the company that makes Corona beer. "The total global (cannabis) category could reach upwards of $200 billion, as suggested by Constellation Brands,'' said Stifel analyst Christopher Growe. Canopy Growth has more than doubled in value this year, and Cronos Group has jumped 72 per cent. GW Pharmaceuticals, which recently received government approval for a cannabis-derived drug used to treat seizures, is up 29 per cent. Growe said the value of the 22 largest marijuana companies trading in Canada has more than doubled since Aug. 15, when the Canopy-Constellation deal was announced. That includes a big gain earlier this week, when the Center for Medicinal Cannabis Research at the University of California San Diego said the Food and Drug Administration will allow it to import capsules containing two key cannabis compounds from Tilray so the centre can study their effectiveness in treating tremors. The stocks are extremely volatile, in part because there is so much speculation about their potential and so many questions and challenges before it's achieved. Tilray jumped 29 per cent Tuesday and 38 per cent Wednesday, and it's dropped 19 per cent Thursday. Recreational marijuana will become legal across Canada on Oct. 17, and consumable forms of the drug will be legal in 2019. Marijuana remains illegal in the U.S. at the federal level, but it's legal for recreational use in nine states and Washington, D.C., and for medical use in 31 states, according to the National Conference of State Legislatures. Growe noted that governments considering marijuana legalization or similar policies are likely to move very slowly. Other analysts say the gains are just too much, too fast. Tilray had just $20 million in revenue last year, but with a market valuation of about $16 billion, it's currently more valuable than Tiffany.